How do people go about making a genuinely mediocre movie? Is it as simple as they don't really try very hard? Or is it maybe that they are less talented and no matter of effort will save them? It's possible that it's the latter and they don't really know. It's also most likely that it's all of the above. You get a guy who has so far directed mostly okay movies and put him in charge of an adaptation of a literary best seller and there has to be at least a small part of him--and everyone else involved--who thinks, "This one is sewn up. We can't possibly blow this, people already like this. Am I right?" Sadly, no, you are not right. You are very, very wrong. Because this is how we get Water for Elephants, a movie based on a novel by Sara Gruen, with a script by Richard LaGravanese (P.S. I Love You, The Bridges of Madison Country), and directed by Francis Lawrence (Constantine, I Am Legend). It stars Twilight's Robert Pattinson as Jacob, a Depression-era college student whose veterinary degree goes up in smoke when family tragedy strikes. Jacob jumps a train for the city, only to discover it's a circus train and not a freight liner. He joins the company, impresses and angers the boss (Christoph Waltz, Inglourious Basterds) all in one go, and falls for the boss' beautiful wife, Marlena (Reese Witherspoon, Walk the Line). 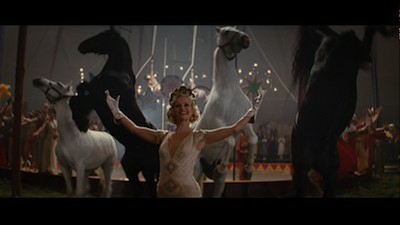 She is the star attraction of the show, the pretty blonde who does acrobatics with horses. It's actually shooting her favorite horse, who is going lame, that both stokes the fires of her heart and the hatred of August, her husband. 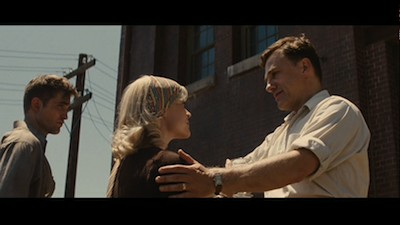 It's that kind obvious, heavy-handed symbolism, coincidence, and duality that hobbles most of Water for Elephants. Later, Jacob tries to save an old man whose legs go bad from drinking toxic hooch. You see, he's trying to learn to have compassion for human and beast equally. Y' get it, ya rube? The dead horse is eventually replaced with an elephant, and Jacob is charged with training the gigantic creature so that Marlena can ride it. This increases the romance between him and the married woman, which eventually boils over and scorches everything they touch. You can't control the elephant, and you can't control love. Both will get you in the end! Woo-ha! One could fill the whole of the internet with a list of how many things don't work in this movie. For starters, Robert Pattinson is perhaps the least effective leading man working in cinema. He has absolutely no presence on screen, and his range seems to go from shy and smiling to shy and not smiling. To make matters worse, the villain is no more exciting than the hero. Between this and Green Hornet, Christoph Waltz has squandered all the good will he gathered as a result of Inglourious Basterds. Sure, he's a working actor, but his loquacious bad-guy shtick has become familiar and stale. He's not a sufficiently interesting performer to overcome bad material. Richard LaGravanese has proven himself to be a capable writer in the past. He wrote The Fisher King once upon a time, and he directed one of my favorite documentaries about movies, A Decade Under the Influence. Here he peddles in a falsely constructed world, one that seems to rely more on a half-remembered idea of what circuses must be like than rather any meaningful research. Jacob is told at the beginning that there is a lot of jargon he will have to learn, but how many circus words actually make it into the screenplay? Three? I haven't read Sara Gruen's novel, so maybe her prose gets more involved in building a magical atmosphere for this romance to unfold, I don't know. The movie version seems about as authentic as a two-headed calf. Water for Elephants was shot by Rodrigo Prieto, who has shown a penchant for both inspired artifice (Frida, Broken Embraces) and romanticism (Brokeback Mountain, Lust, Caution). One could argue that he and Francis Lawrence are working here to create a classical postcard image of a bygone dream of what the showbiz life was like, something akin to Fellini or maybe even Bergman's Sawdust and Tinsel. Ironically, they never convince the viewer that this movie takes place anywhere but on soundstages and back lots. The painted skies make it look like they wanted to create an effect similar to Baz Lurhmann. This is Moulin Rouge on half the budget. And yet, I hate to say it, Water for Elephants is not completely terrible. Despite the fact that I can't find a single reason to recommend this film, I don't completely hate it. Would that it were so vile! Rather, I just don't care. I am so unenthusiastic about Water for Elephants, I can't even summon any anger over having wasted my time watching it. 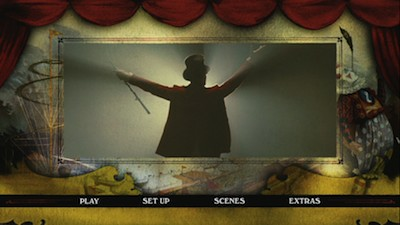 Instead, I just want to rip up the stakes on this cinematic big top and move on to whatever's next. The sooner this debacle becomes a distant memory, the better. As with many Fox releases, the copy sent to us for review is not the final retail version, but a watermarked CDR that is difficult to assess because we don't know how accurately it represents the full version. I would hope Fox doesn't want me judging this disc this way, since it's actually one of the worst screeners I've seen from them. Usually, the quality isn't too far off, but given all the jagged edges and fuzzy coloring I saw, fingers crossed that the retail copies will look nothing like this. The main audio option is English 5.1, and there are also French and Spanish versions in 2.0. Optional subtitles are Spanish and English Closed Captioning. The DVD has three featurettes, which apparently is decidedly less than what you'll find on the Blu-Ray. 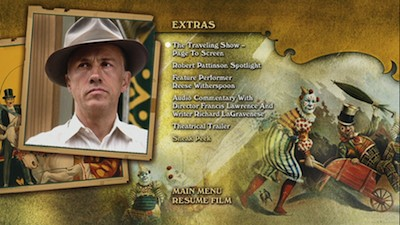 They are "The Traveling Show--Page to Screen,", which is 9 minutes focusing on Sara Gruen, and two actor spotlights, 4 minutes on Pattinson and less than 3 on Witherspoon. A theatrical trailer is also included. Skip It. 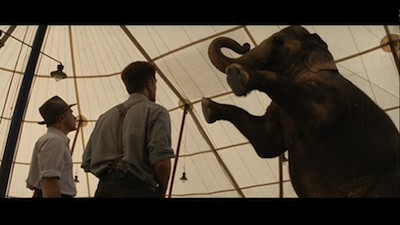 Water for Elephants is high-priced, bland pabulum. Underwritten, shoddily performed, and poorly directed, this tepid romance under the big top fails on every level--including failure. It's not even that bad, really. It's just lazy and dull. It makes going to the circus boring. Where is that killer clown from It when you need him?